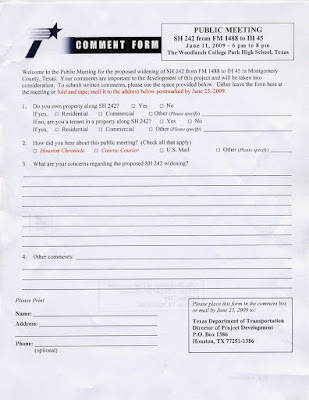 You still have until the 25th of June to submit your comments about the 242 project to the Texas road project management team at TXdot. 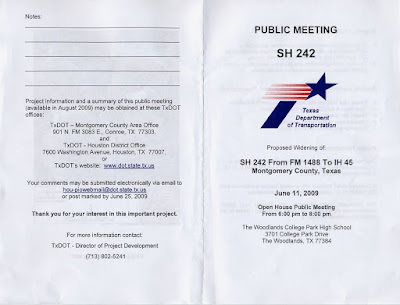 This evening many residents attended the TXDot meeting on the proposed project to widen SH 242. I did not collect all the facts presented, but there was not a great deal shared. 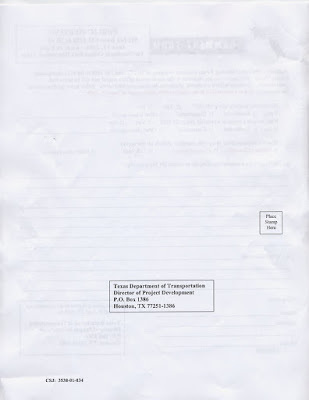 I will tell you what the basics are to help you send in your comments if you wish to do so postmarked before June 25, 2009 or emailed before June 29, 2009. Western end from Green Bridge to FM 1488 has one-half of the traffic count as that from I45 to Green Bridge. Therefore, one-half of the traffic dissipates from I45 to Green Bridge or is absorbed into businesses and The Woodlands neighborhoods. Traffic is predicted by consultants, based on measurements, to double in the next 25 years. Project purpose is to handle traffic for predicted population growth, relieve congestion, traffic safety, and to increase peak hour traffic speed. Median is 44 feet wide now and will be 22 feet and raised, after construction. "brush", i.e., the small trees in the median now, will be removed. Medians will be planted with grass. We will have to pay for any trees or brush to be placed there afterward. Roadbed architecture would remain the same with 2-inch slope from center to edge. They would avoid construction on the outside of the shoulders. Construction would not interfere with current traffic. Additional lane proposed on both sides all the way to FM 1488. Fly-over not a part of this project. Apparently no plan to alter turn lanes at Gosling or Green Bridge. Estimated cost would be $11 million. This is the first call for comments. Project is in planning stage. Studies to be conducted after resident comments are assimilated. 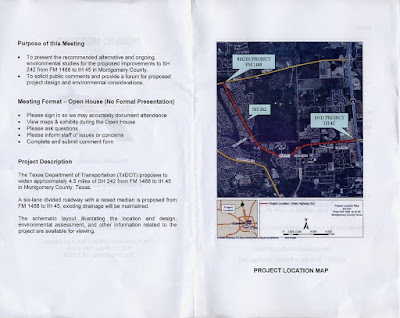 2011 the next meeting, a public hearing on the detailed project. 2012 construction begins if money can be appropriated for the proposed project. No noise mitigation proposal was included in the project.